In August, 2017, Asuncion gave us a warm welcome during the first week of August, when I had the pleasure of addressing a group of banking representatives from Paraguay, at an event we organised on behalf of The London Institute of Banking & Finance (LIBF) and the National Committee of the International Chamber of Commerce (ICC) in Paraguay. The event was organised in order to present LIBFs Trade Finance Certifications, namely, Certificate for Documentary Credit Specialists (CDCS®), Certificate for Specialists in Demand Guarantees (CSDG®) and Certificate in International Trade and Finance (CITF®), designed in partnership with the ICC. 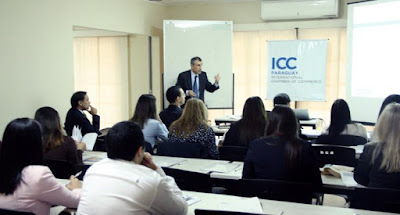 It was also announced that ICC in Asuncion would become LIBFs exam centre, for these certifications, in Paraguay. It was an intense week during which we also had the opportunity to call on the Central Bank of Paraguay, the British Embassy and even be interviewed by the T.V channel of the financial daily 5dias. It was a very rewarding experience and very glad to see so much interest in the educational offering of LIBF and in particular its Trade Finance Certifications. My thanks to Estefania Careaga, Coordinator of ICC, Paraguay; Paola Quiñónez, President of the Banking Commission and Head of Trade Finance for Banco Regional; and Daniel Oviedo, Executive Director.